Yup, that is my motto this summer. I don't want to get out of bed. Oh that doesn't mean I'm actually horizontal, rather I just want to be comfy, all day, all summer long. I can't think of anything more comfortable than when I first get into bed at night. The mattress, pillows, sheets & quilt, they all call me to slumber. It's a good feeling, one worth preserving and sharing. So here's what's up. I had a need to sew this past week, but didn't want to do anything too strenuous like finish the quilt on my cutting table which would require awkward body positions for basting and quilting. I did something weird to my back/hip and so contortionist sports are not a good idea right now. Instead I wrote up a tutorial for y'all in celebration of summer and all that is good about it. Are you still with me? It's a pdf download with lots of instruction and photos...don't get out of bed pants available on my tutorials page. Print it up and give it a whirl for yourself, kids, hubby, sister, mum, the dog? ?...well maybe not the dog but you know, anyone you can think of as long as it stays in gift format all is good. The tutorial is meant for personal use only and items made from it are not to be sold. Oh yes, now we're talking. I have several pairs of something very similar (I think I may even have a matching pillowcase for your sheet in my stash) I can definitely vouch for their comfiness! I look forward to trying your version! amazing pants!!!! i love wear pj pants all day! of course not every day, but i enjoy to much the sundays when we don't get out of bed. thanks for sharing! ps. was a nice surprise to know that you visit my blog! You're too funny, lol! I'm still not finished The Time Traveler's Wife and need to quickly. The movie comes out next month. I enjoyed Inkheart, it took me a bit longer to work through Inkspell (I blame the move...for everything ;) and I'm still not finished Inkdeath. One day though. That show looks very interesting...I'll definitely check it out! Thanks for the heads up. Several pairs? you are a lucky girl. Oh and I love that top you made with the retro sheet. So cool! oooo... i have been looking for just such a pair of pants. now if i can get my hands on some heather bailey fabric to make them out of, i am a happy gorl. 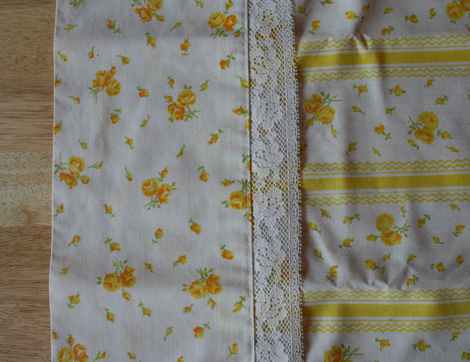 I love the photo of your vintage linens stash! Thanks for the Tute! This summer - when I do get to the sewing machine - it's been all old linens...tried a peasant nursing top - which turned out much better as a dress for Selah. as per the tin of cocoa - i'm not sure if blogspot sends updates of the comments so, copy and pasted: "When my parents inherited the cottage - most everything was left including that tin which had rarely(if at all) been used! Honestly, I don't know how old it is, my assumption is that it is from the 60's. I wasn't going to try any - the lid had spots of rust on it - "can cocoa go bad?" my mom asked. I pryed the can open and the shiny metal inside looked like I bought it yesturday! I am a cocoa fan, we buy it organic, from my food co-op...i've tried all kinds - but this by far was the BEST....could it be that aged cocoa tastes better than fresh? My mom's thoughts are that it was just better quality." old linens are the best when you can find them...hence my stash. It represents many trips to the thrift store. that is one crazy old tin of cocoa. that is amazing that the rust did not go inside the can. I'm thinking that most things get better with age...and I'm holding onto that idea tightly because next month will be my birthday. i'm going to email you about your food co-op. Comfy looking pants! Thanks for the pattern-I'll try it soon. 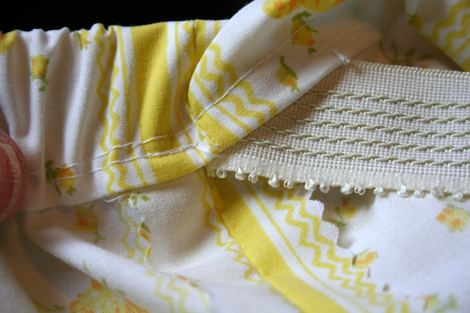 Will go perfect with Betz White's shirred top tutorial on craftzine.com. I'm looking forward to some comfy P.J.s! oh, and I forgot to add, I have that same exact yellow sheet that you used! OMG! This material is what i have had as a comfort blanket virtually my entire life! Sadly, im almost 30 now and the material basically disintergrated. If any of you lovely ladies know where i could source some of this material i would be forever grateful. Or perhap someone could put some on an ebay auction and post the link here? I do anything to get hold of some!! Thanks for sharing a fun pattern. I have been looking for something just like this. I appreciate your taking the time to put this together. Have a lovely day! Great pattern and WOW - I really DIG you vintage linen closet!!! I'd kill for that stash! 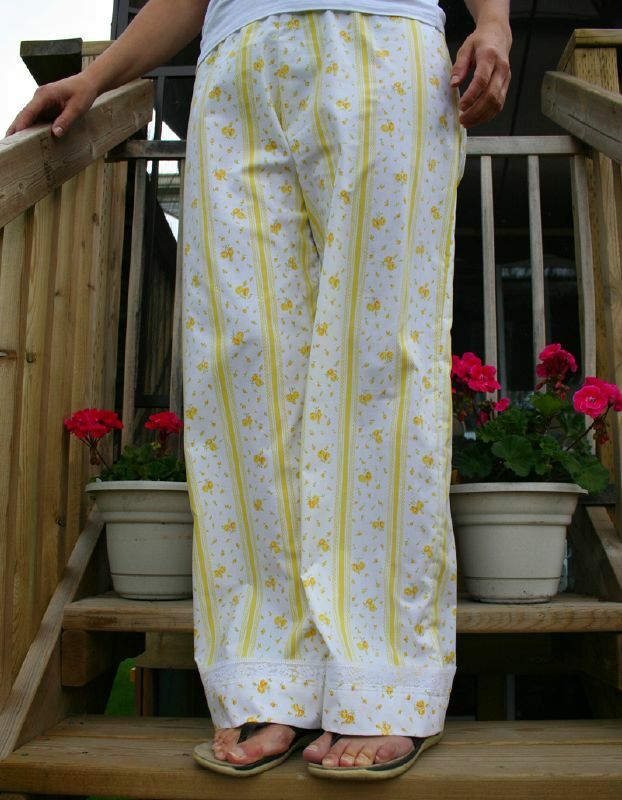 That fabric is to die for - there isn't a better pj pant fabric out there I don't think. Lovely. Oh happy to assist in the addictive cycle and after an 11 hour car trip you need a good sewing reprieve. I love the trim on your pjs...very cute! Funny, I've had a few people tell me that. You are not the first to express interest in this fabric. If I have any available in the near future, I'll be sure to contact you. Best wishes. Your welcome, I hope the tutorial works out for you. happy sewing. I've been collecting for a little over a year now. It's quite addictive. Oh the lounge shorts sound like fun! They are going to be so comfy. Let me know how it goes. Oh how neat! I just bought an awesome vintage flat bed sheet at the thrift store and this project is perfect for it! Thank you for sharing it. so glad to help in the very addictive "sewing with vintage sheets" cycle. Enjoy! Oh, so cute! Thanks for the tute and they look so comfy, I'll stay in them all day for sure! Thank you thank you thank you! I just bought a sheet to do this and now I don't have to make up my own tutorial! I can just follow yours! I seriously just bought them like a week ago and have been putting off making them...then I see your tutorial at Sew Mama sew, sweet serendipity! Hah! I just put up some of these sheets on my etsy today! I cut them all up though! I was doing a little spring cleaning and realized I just have too much! Oh thanks Rebecca. Youd be surprised how many people emailed me about the sheets that I used for the tutorial. I mailed off the rest of the supply that I had to England because one gal really needed it. If I hear of anymore Ill point them to your shop! please let me know if that would be all right! sorry to get back to you so very late. I did a little experiment and went offline for the summer...it's been a good time away, but soon I will be getting back to the business of blogging and creating. Can you tell me what is involved in feature this tutorial on your blog? How cool are these and I ADORE your pretty yellow VS too. I recently purchased 2 VS with pretty fabric bands and lace - though no where near as pretty as yours I might add - and can't wait to try these. I hope to make a mini pair for my little grand-daughter from the matching pillowcase too. Thanks for sharing - hope it's ok that I shared the link on my blog too. Awesome! This is just what I was looking for ... came across some awesome flannel sheets the other day - we don't need them for beds, but I know some kids who'd love some flannel jammie pants! Delighted to find this project! Looking forward to making some for my daughter (6'ft) and me. It's hard to find her pajama pants that are long enough! Ty!